Earlier this week the prospect gurus at MLB.com released their annual top 30 Yankees prospects list. The other scouting publications released their Yankees prospect lists within the last few weeks as well. As always, MLB.com’s list is entirely free. The list, the scouting reports, the scouting grades, the whole nine. It’s a great resource. Noticeably absent from MLB.com’s top 30 list is RHP Freicer Perez, who ranked eighth last year. Six disaster starts and season-ending shoulder surgery will do that. I dropped Perez to 19th on my top 30 list. Anyway, here are some thoughts on MLB.com’s top 30 list, or rather some thoughts on the information included in the scouting reports. 1. Putting numbers on Florial’s tools. Most of the chatter about Florial this winter revolved around his pitch recognition, or lack thereof. And yes, his pitch recognition is a significant issue. It must improve for him to have a long and productive big league career. Fortunately he turned only 21 in November and has time to get better. As a reminder, 20 on the 20-80 scale is terrible, 80 is great, and 50 is average. Florial is above-average in four of the five tools and a full grade better than average in three of the five. His 45 hit tool is what prevents him from being a truly elite prospect, but damn, four above-average tools? It’s easy to lose sight of that. If he is able to conquer his pitch recognition issues — a big IF, of course — Florial can be a big time all-around impact player. 2. Are Medina’s issues mental? RHP Luis Medina has the most electric arm in the system. It’s easy upper-90s gas with a hammer curveball and a good changeup. The kid just has no idea where the ball is going. He walked 46 batters in 36 innings with Rookie Pulaski last year, or exactly one-quarter of the batters he faced. Medina also uncorked a dozen wild pitches, so yeah, control is an issue. Medina’s issues aren’t physical — his delivery is fine and his arm stroke is clean. Instead, the problem appears to be mostly mental. He’ll throw well in the bullpen only to have things will snowball for him in game situations. One source described his issues as stemming from a need for greater mental maturity and to not be so hard on himself, which are exactly the kinds of traits that come with general social maturity. Huh. Most of what I’ve read attributed Medina’s control issues to a delivery he struggles to repeat. MLB.com and FanGraphs both say that no, the delivery is good, the control problems are more mental than physical. Medina is still only 19 and it’s silly to think he should be more polished than he is at this age. Dellin Betances had (has) similar stuff and it took him until his mid-20s to harness it. Medina strikes me a similar long-term project. Strike-throwing issues stemming from a mental block seem more difficult to correct than strike-throwing issues that stem from a bad delivery, but who knows. Everyone is different. Medina’s control issues are bad but we’re not in Jeff Degano/Jason Neighborgall territory either. Hopefully as he gains experience he’ll get the ball closer to the plate. I just thought it was interesting to read his control problems could be mental rather than related to his delivery. Somewhat reminiscent of former Yankees star Orlando Hernandez, Rodriguez has a seemingly endless combination of pitches and arm slots. He has an electric arm that produces 92-95 mph fastballs that top out at 97 with high spin rates that give him rising life up in the strike zone. His hard curveball is a bit more effective than his harder slider, with both displaying the potential to become plus pitches, and his changeup has splitter action and similar upside … He has a lofty ceiling, as his chance to develop four plus offerings could make him a frontline starter. Well then. Rodriguez will play this entire season at age 17 and he’s yet to appear in a pro game, so as exciting as that scouting report is, we have to pump the brakes a bit. The scouting report mentions he “doesn’t have the cleanest arm action and there’s effort in his delivery,” which you can see in the video below, and pro hitters will tell us what they think about Rodriguez once he gets into games. Since the 2014-15 signing spree dud, the Yankees have done some great work internationally — six of MLB.com’s top ten Yankees prospects were originally signed internationally by the Yankees — and Rodriguez (and unranked OF Kevin Alcantara) looks like this year’s breakout candidate.
? 4. I’m not the only Myatt fan. I ranked RHP Tanner Myatt, last year’s 11th round pick, as the 27th best prospect in the system. MLB.com has him 29th and no other scouting publication even mentioned him in recent weeks, let along ranked him on a top Yankees prospects list. I’m not saying he’s a future ace or anything, but a 6-foot-7 20-year-old with an upper-90s fastball and a wipeout breaking ball will never look out of place on an organizational top 30 prospects list. 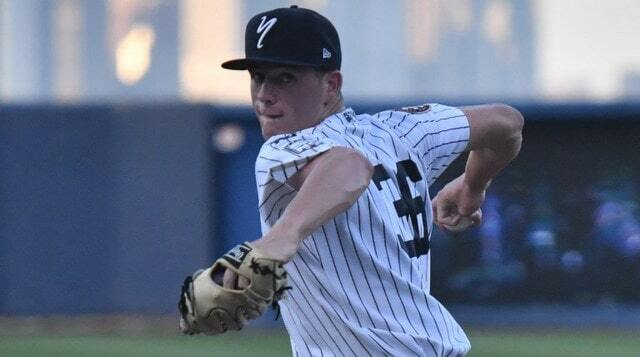 MLB.com’s scouting report says Myatt has “excited the Yankees with the progress he made with his secondary pitches” since the draft, and adds “New York sees him as a potential three-pitch starter but he could wind up as a flamethrowing reliever.” Either outcome would be fantastic for an 11th round pick and a $147,500 bonus. I’m glad I wasn’t the only person to consider Myatt a top 30 prospect in the organization this spring. I must’ve watched this video of him carving up Instructional League hitters a dozen times over the winter. 5. The Yankees are really short on infield talent. There is one (1) infielder on MLB.com’s top 30 Yankees prospects list. That is SS Thairo Estrada, who is coming back from what was essentially a lost season. That’s it. He’s the best infield prospect in the organization. The Yankees are very deep in pitching (21 pitchers in the top 30) and Florial, Pereira, and Cabello give them some high-end outfield talent. The infield? Not so much. 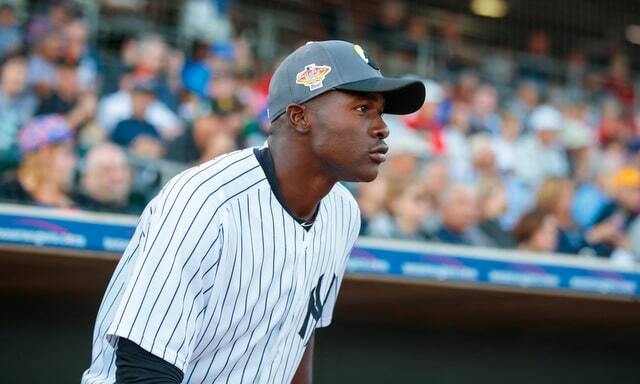 Granted, having Gleyber Torres and Miguel Andujar at the big league level lessens the need infield prospects, but the infield is a weakness in the farm system right now. Recent international signees like SS Ronny Rojas, SS Roberto Chirinos, and SS Oswald Peraza could help correct the infield deficiency in the coming years. At this time last year the Yankees were short on catchers. Now they’re short on infielders. I don’t believe the Yankees specifically drafted Seigler and Breaux to address their catching shortage last year and I don’t think they’d prioritize infielders early in the draft this year either. At the top of the draft, you have to take the best talent regardless of position. Drafting for need is pointless because it’s so difficult to project what you’ll need three or four years down the line, when that prospect is big league ready. That all said, it would certainly be convenient if the best available player is an infielder when the Yankees make their first few draft picks this summer. The system needs an infield infusion. Myatt, 20, grew up in Spring Lake, North Carolina, near Fayetteville and Fort Bragg. He attended Overhills High School and pitched to a 2.75 ERA with 63 strikeouts and 18 walks in 43.1 innings as a senior, and also hit .312/.365/.395 in 52 plate appearances. Baseball America (subs. req’d) did not rank Myatt as one of the top 500 prospects for the 2016 draft and he went unselected out of high school. After going undrafted Myatt headed to Florence-Darling Technical College in South Carolina. He put up a 3.76 ERA with 34 strikeouts and 16 walks in 26.1 innings as a freshman. Myatt again went undrafted in 2017 — he wasn’t among Baseball America’s (subs. req’d) top 500 draft prospects — and, as a sophomore, he threw 30 innings with a 1.89 ERA and 39 strikeouts against 20 walks. He made four starts and ten relief appearances. Baseball America (subs. req’d) did not rank Myatt among their top 500 prospects for the 2018 draft, though they did rank him the 16th best prospect in South Carolina (subs. req’d). The Yankees selected Myatt with their 11th round pick (337th overall) last summer, making him the highest draft pick in Florence-Darling history. Myatt leveraged a transfer commitment to the College of Charleston into a $147,500 bonus. Every dollar over $125,000 given to a player taken after the tenth round counts against the draft pool, so Myatt counted as $22,500 against the pool. After signing Myatt was assigned to the rookie Gulf Coast League, where he had a 6.06 ERA (5.07 FIP) with 22 strikeouts and nine walks in 18.1 innings. That works out to 30.8% strikeout rate and a 10.8% walk rate. 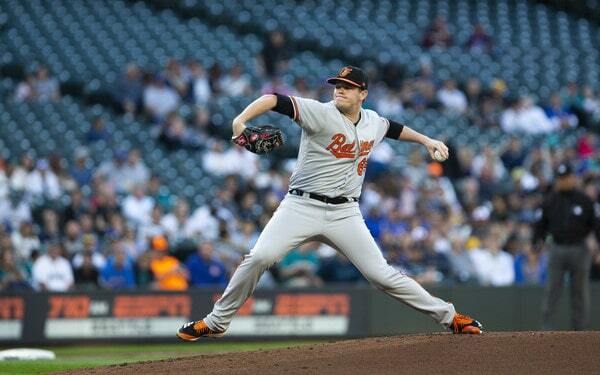 He made five starts and four relief appearances. 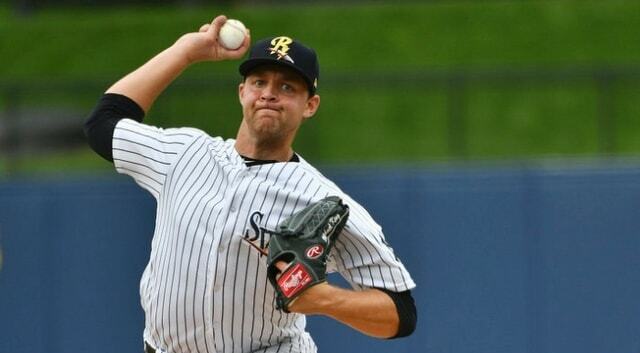 Myatt closed out his regular season with one appearance for Short Season Staten Island, striking out two and walking two in two scoreless innings. He then participated in Instructional League after the season. Myatt is certainly a pitching prospect you can dream on. The kid stands 6-foot-7 and 220 lbs. and he came out of college with a fastball that averages 96-99 mph and touches 101 mph. 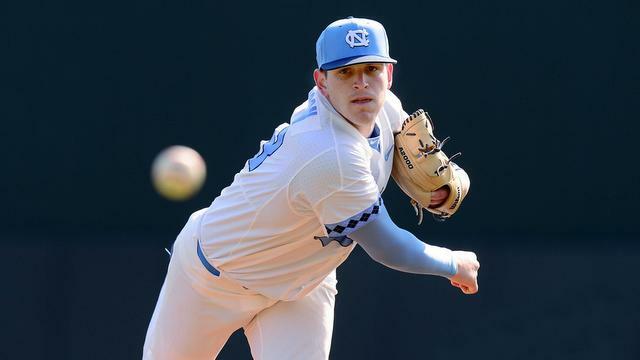 According to Shaun Savarese, Myatt started training at a local pitching biomechanics lab (N.C. Biomechanical) during the summer between his sophomore and junior years of high school. I reckon that helped him develop his premium arm strength. In addition to the velocity, Myatt’s fastball has explosive life through the strike zone, so it plays even better than the radar gun reading. Add in the fact he’s releasing the ball that much closer to the plate thanks to his height, and Myatt’s heater is a truly elite offering. He pairs it with a promising curveball and changeup, the former of which has flashed out-pitch potential. Myatt also threw a cutter in college but it seems it is no longer part of his repertoire.
? Myatt has already made strides gaining consistency with his delivery since the draft, but he is young and incredibly tall, and it typically takes tall pitchers some time to develop solid mechanics and master control of those long limbs. The Yankees have plenty of experience with tall pitching prospects (Dellin Betances, Domingo Acevedo, Andrew Brackman, Freicer Perez, etc. ), but everyone is different, and Myatt will develop at his own pace. Because he’s so big and his delivery can fall out of whack, Myatt does have trouble throwing strikes, and that is his primary development goal going forward. That and improve his curveball and changeup. Firm up the delivery and learn how to get the ball over the plate consistently. Given the quality of his fastball and overall stuff, Myatt does not need to develop above-average command (it would be cool if he did). He’ll get swings and misses and weak contact simply by being around the strike zone. I expect Myatt to begin this coming season in Extended Spring Training for three reasons. One, he’s a big dude who needs mechanical refinement, and ExST is the best place to do that. Two, Myatt doesn’t have much pitching experience. From 2015-18, he threw 153.2 total innings between high school, college, and pro ball (plus a handful more in Instructs). His career high is the 48.1 innings he threw between college and his pro debut last year. I can’t see the Yankees throwing him right into full season ball. And three, Myatt’s still pretty young. He doesn’t turn 21 until May. Given all that, ExST to start with an assignment to one of the short season leagues in June makes the most sense for Myatt in 2019. I knew nothing about Myatt when he was drafted and I’ve very quickly fallen in love after doing some research. I’m a sucker for big power pitching prospects and he is right out of central casting. Myatt has a long way to go between where he is now and the big leagues, but the raw tools are very impressive, and you can’t teach his size and arm strength. I’m not sure Myatt will ever develop good enough control and command to start. In short relief bursts though? He could be a monster. Myatt’s is a classic high risk, high reward type with significant upside. I’m not sure you could do much better than this with an 11th round pick and a $147,500 bonus.